It's July and I love July for many reasons...one of them being the rose gardens at Pt. Defiance Park! The floral arch is more spectacular this year than past years because the roses have really filled in and the center divider is complete and fully planted. Just look at those dark greens and brilliant pinks, they make an excellent background for families, seniors, maternities or nearly any type of portrait session. It even gives off a dreamy, romantic feel which is perfect for engagement or bridal photos. If I could pick one place to bloom all year, this surely would be it. 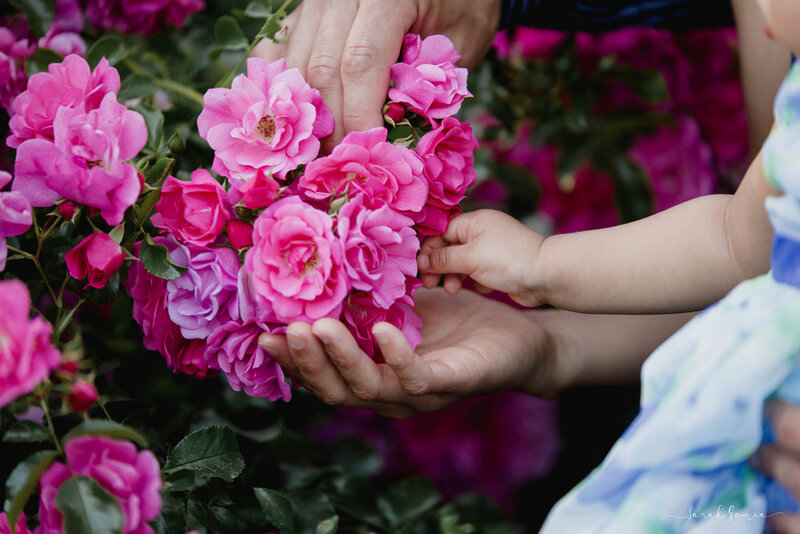 With their daughter's recent first birthday and the full bloom of this arch, The Craddock's family portrait session couldn't have been more perfectly planned. 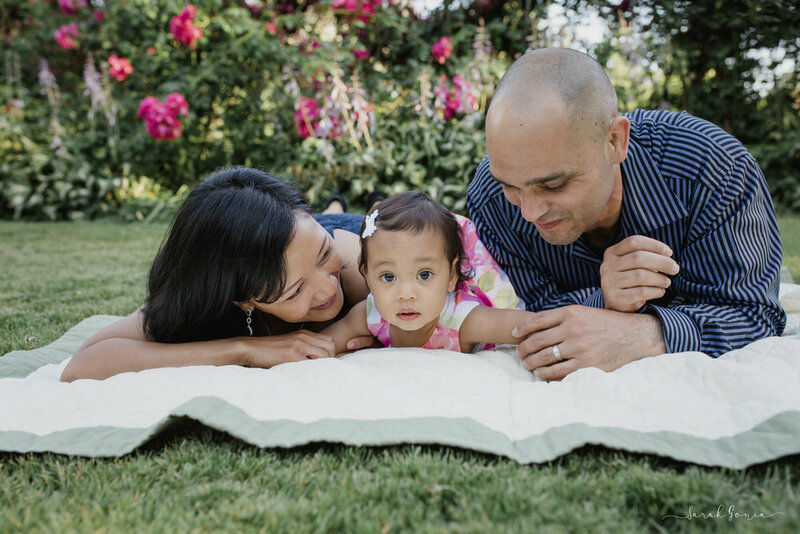 This adorable little family was so fun to work with and I am super happy that they booked me. Not only were they great to work with but their little girl is just a month younger than mine and it was sweet to see the similarities in their development. Final note on the arch picture.....isn't that little pink floral dress PERFECT!!! Well, believe it or not the stunning floral arch was NOT the highlight of the session! There are two things about this session that will always stand out in my mind, the first being the interactions between these three. They are so affectionate, kind and caring towards each other and there is definitely no shortage of love. 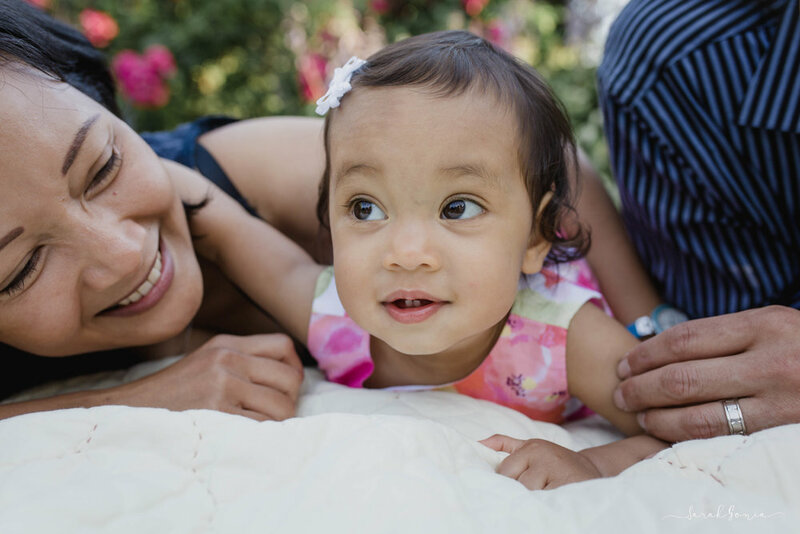 When families are relaxed and happy is when I am able to capture the most candid, beautiful moments but it may take some people awhile to warm up in front of the camera (which is OK!) The Craddock's were such a sweet and fun little family unit that not much warm up time was needed before they were laughing and playing with their daughter. I seriously LOVE to capture those interactions and the raw, genuine emotion that happens during them. Ok, now for my favorite highlight of the session (and no it's no the blizzard I had after)! Like my daughter this little one hadn't yet taken her first steps nor stood unassisted - yet with the magic of the park and our cheers to guide her she stood for the fist time on her own. I'm pretty sure I teared up several times watching this milestone through my lens. Not only did she stand but she then squatted, maintained her balance and then stood again...several times!! 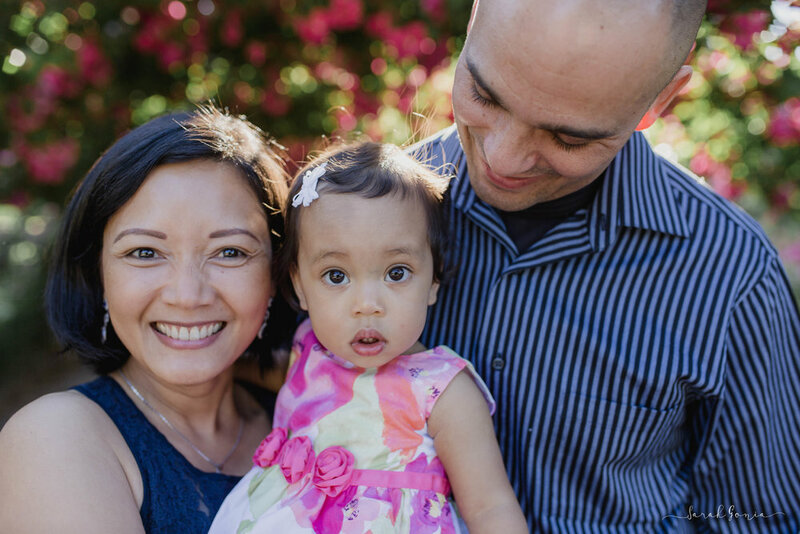 It's moments like this that make me realize how important family and milestone portraits are. After time memories will fade but a photo capturing a moment like that will live forever.